Looking for a sample Will or Will template? It sounds like you’re ready to take a big step toward taking care of your family. According to a recent Rocket Lawyer survey, 57% of Americans do not have a Last Will and Testament. If you’re a member of that majority, or if you simply want to make a new, legal Will, we make it easy to protect your family, your assets, and your legacy. Get Started Start your Last Will & Testament Answer a few questions. We'll take care of the rest. Here's a sample Will. When you create a will, yours will look similar. Sample Will. To create your own free personalized will, click on the image above. 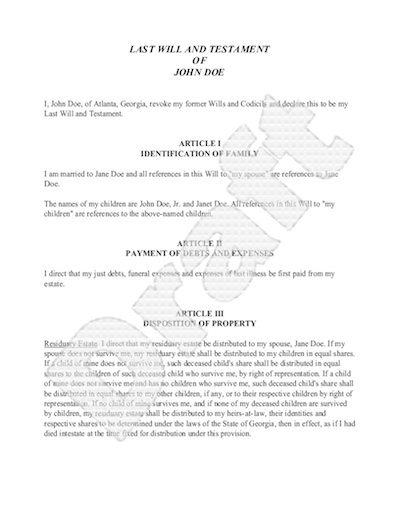 Like all Wills, this sample will allows you to divide your property, provide for your loved ones, set up trusts, make specific bequests, and even choose a guardian for your children. You can set aside money to pay for funeral expenses and choose an executor for your estate. Going from sample will to legally binding will take just a few minutes. We’ll ask you some questions about yourself and your wishes. At the end of our interview, we’ll give you a copy of your Will and let you know what you need to do to make your Will fully legal. This final step, called execution, typically involves a visit to the notary where the signing of your will is witnessed by one or more people.